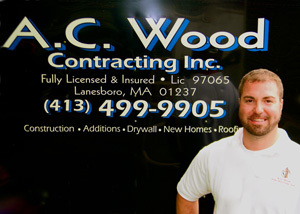 About A.C. Wood Contracting, Inc.
A.C. Wood Contracting was started out of the desire to provide the utmost in quality contracting services and has been serving the needs of Berkshire County's home owners and businesses ever since. With a crew of half a dozen of employees, and carefuly selected partnering building trades providers, our goal is to exceed our customer expectations each and every time we are on site. Contact us today to schedule an estimate for quality home improvement services you can trust. It is our pleasure to write this Letter of recommendation on behalf of Adam Wood, of A.C. Wood Contracting.